This final advent blog comes from Museum friend, Nick Pemberton. Many thanks to all those who contributed to this series, and Merry Christmas from all at the Museum. This is the tale of the legendary Godolphin Arabian, one of the founding fathers of the thoroughbred, and whose story at times reads like a Dickens novel. Along with fellow imports, the Darley Arabian and the Byerley Turk, the Godolphin Arabian completed the trio of foundation sires from which all modern day racehorses descend in direct male line. It is worth noting that although the Darley Arabian line via Eclipse is now dominant, the Godolphin Arabian line still remains a significant influence even today. The Godolphin Arabian was born around 1724; it is believed he was sent as a gift to the King of France, Louis XV, from the Bey of Tunis. Romantic stories of the horse being found pulling a water cart around the streets of 18th century Paris are sadly just fictitious. In 1729 he was imported into England by Edward Coke who briefly stood him at his stud in Derbyshire, but following Coke’s death ‘ye Arabian’ was bequeathed to Lord Godolphin. There is no record of the Godolphin Arabian having ever raced, and indeed there are no details of his pedigree. Another legend is that the horse was originally only used as a teaser at stud. When the stallion Hobgoblin refused to cover the mare Roxana, the Arabian covered her instead and the mating produced Lath who turned out to be an exceptional racehorse. He quickly proved to be an outstanding stallion at the Godolphin stud, veterinary surgeon William Osmer wrote “There never was a horse…so well entitled to get racers as the Godolphin Arabian…his shoulders were deeper, and lay farther into his back, than those of any horse yet seen. Behind the shoulders, there was but a very small space where the muscles of his loins rose exceedingly high, broad, and expanded, which were inserted into his quarters with greater strength and power than in any horse yet seen”. From the same mare Roxana, the Godolphin Arabian later got Cade who went on to sire Matchem, one of the greatest sires of the eighteenth century, and who was responsible for the perpetuation of the sire line. The Godolphin Arabian himself was champion sire three times and, including Cade, also sired three champion sires. Another famous grandson was Whistlejacket, a very good racehorse but perhaps better known as the subject of one of the most famous equine portraits in the world. 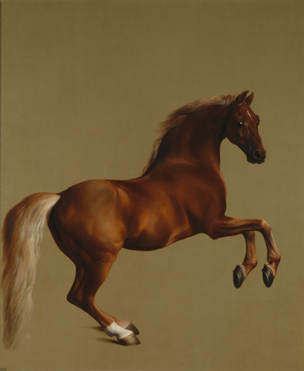 The painting by George Stubbs hangs in the National Gallery, London. His influence on the following generations can be demonstrated by the fact that fifty years after his death, every one of the first 76 British classic winners had at least one strain of the Godolphin Arabian in their pedigree. And later Man o’War, who was related in direct male line back to the Godolphin Arabian, would prove to be one of the all-time great American racehorses. It is through Man o’War’s descendent Tiznow, a leading US sire and his various stallion sons, that the Godolphin Arabian line is still successful. In Europe the line has principally survived through Known Fact, also descended from Man o’War. His son Warning and grandson Diktat were both successful on the racecourse and at stud. We must hope that recent champion sprinter Dream Ahead, a son of Diktat, can continue the direct male line in Europe. What is the link with the Godolphin Arabian and Christmas I hear you ask? Well, having been at stud for around twenty years the great stallion sadly died on Christmas day 1753 at the age of 29. The stable cat, Grimalkin, who often featured in the horse's portraits and with whom he shared a long friendship, reportedly died of grief soon after. I can give you one further festive connection - the last Derby winner who is descended from the Godolphin Arabian in direct male line is none other than the 1964 winner Santa Claus.